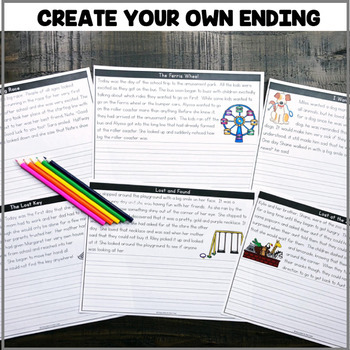 This "Create Your Own Ending" Center is a part of the December Centers Bundle for 2nd Grade! This center is great for reading fluency, comprehension AND writing! Your students will love putting their own spin on the story ending for each of the passages! RL.2.5: Describe the overall structure of a story, including describing how the beginning introduces the story and the ending concludes the action. Thank you for your purchase! By purchasing this resource, you are agreeing that the contents are the property of Emily Garcia/Education to the Core, and licensed to you only for classroom/personal use as a single user. I retain the copyright, and reserve all rights to this product. • Use items (free and purchased) for your own classroom students, or your own personal use. • Reference this product in blog posts, at seminars, professional development workshops, or other such venues PROVIDED there is both credit given to myself as the author and a link back to my TPT store is included in your post/presentation. • Distribute and make copies of free items only to other teachers PROVIDED there is credit given to Emily Liscom Garcia and a link back to my TPT store. • Claim this work as your own, alter the files in any way, or remove/attempt to remove the copyright/watermarks. • Sell the files or combine them into another unit for sale/free. • Obtain this product through any of the channels listed above. Thank you for abiding by universally accepted codes of professional ethics while using this product.